This sale brought home to me the recent changes in the international awareness of the value of South East Asian photographs. On 22 February 1900, S Lian Seah had inscribed his personal portrait ‘with kind regards’ to a Mr S Tomlinson. What struck me about the image was the self -possession even kindly good humoured expression of Mr Seah. A hint of a smile as he he responded to the photographer’s direction to look to the right away from the lens. This was not the usual portrait of ‘John Chinaman’ types sold by photo studios in the port cities of Asia as souvenirs since the introduction of cheap miniature portraits known as cartes de visites in the early 1860s. I couldn’t read the Chinese character version of his name but made a stab at what the name looked like via the ‘good fairy’ of researchers a google search. Several entries later and using the name S Liang Seah, I came up with details on the prominent millionaire Singapore born Teochew community Chinese merchant, Seah Liang Seah (佘连城, 1850–1925). He was a member of the Legislative Council and Municipal Commissioner in the 1880s‐1890s. Seah Liang Seah had bought the mansion property of Hoo Ah Kay, who was an earlier leader of the Kapitan China (leader of the Chinese community). Hoo Ah Kay, was known as Whampoa, a name derived from his birth place in Whampoa in Canton (Guandong). In 2012, I had bought a circa 1863 portrait by John Thomson’s Singapore studio of Hoo Ah Kay for the National Gallery of Australia. I later realised that it was a portrait of the well‐known businessman and not a man from the Guandong town. Satisfied by discovering who Seah Liang Seah was, I researched Mr Tomlinson to discover that he was Sam (Samuel) Tomlinson (1859‐ 1935). He was born in Yorshire and was formerly Deputy Engineer of Bombay Waterworks from 1886–1895 and then municipal engineer in Singapore from 1895–1902. I now suggest that the cabinet card was possibly sent by Seah Liang Seah to Mr Tomlinson on the occasion of Mr Tomlinson’s resignation from the municipal office to start his own practice, Tomlinson & Lermit (civil engineers, surveyors and architects). The cabinet card by GR Lambert & Co imparts the story both of the role of the ‘Kapitan China’ in Southeast Asian ports and their adoption of the styles and status of portrait photography by 1900. I was not alone in making my observations of this sale. Based on sales over several years now, one would have expected this cabinet card might have sold for about US$200 or maybe a little more. But much to my surprise the price rocketed to US$1,300. The purchaser (not me) and others bidders knew the identity of the sitter and the importance of this image to Singapore’s heritage. The high price reflects the recent change in the market for South East Asian photography along with growing interest in Singapore’s significant rich history as a key port city. Based on current research, it appears this is a rare surviving original print of Seah Liang Seah. 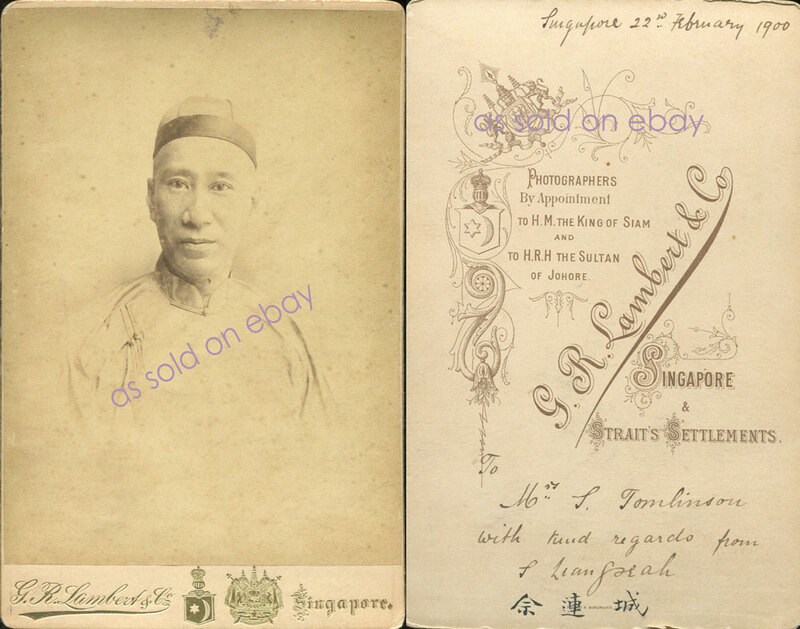 I expect that as such noted Singapore personalities are identified in 19th Century photography, that we could see such prices easily double again, especially as more well informed collectors are entering the market. Picture Paradise: Asia Pacific Photography, 1840s‐1940s, click here / publication click here.